The Carlungie earth house, or souterrain, is one of the longest in Scotland, at 140 feet in length. The winding passage is one of the most complex earth house structures in Scotland. Despite the name, it is not a house, nor is it built of earth. It is instead an underground storage passage and chambers supported by stone walls. There are 4 entrances to the main passage, which must have stood up to 6 feet high when built. The walls are made of a combination of flagstones and boulders. The passage ends in a small chamber which may have been a workshop. The curious thing is that the roof slabs would have protruded at least 2 feet above the ground level, so the structure could not have been hidden from view. Excavations on the site suggest that it may have been used as a byre for cattle or sheep. There are no traces of the roof, suggesting that it may have been made of timber. Archaeologists uncovered remains of a small settlement near the earth house, with at least 8 huts. Curiously, 7 of the huts were built of stone, but one of timber posts. The earth house appears to have been taken apart and filled in deliberately after it had gone out of use. One of the stones used to block the passage was found to be marked with a cup and ring carving. At some later date, a large byre was built over part of the earth house. Only one piece of pottery was found on the site; a Roman amphora lying in one of the huts. The amphora is now on display in Dundee Museum. Archaeologists concluded that the most likely date for the site was between 50 BC and AD 450 and the earth house was destroyed between AD 200 and 250. Numerous theories have been suggested, including secret underground hiding places. The most likely answer is that they were simply used as a cool storage area, an early form of refrigeration, with a relatively constant temperature for storing grain and produce. They may have been used to store grain for the Roman armies during their attempt to subdue Scotland in the 2nd century AD. 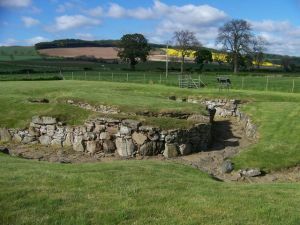 Most earth houses, like Carlungie, were filled in sometime before AD 200, as if they had fulfilled their purpose.